Who organized Seattle’s first jazz festival in 1939? It was a member of the Husky Hot Club, a junior at the University of Washington named Norm Bobrow. When Seattle led the nation in gender equality by being the first major city to elect a woman mayor in 1926, how many women were in the Seattle Symphony? Less than ten percent of the orchestra’s musicians were female. Are there any operas about the state of Washington? In 1912 a local woman wrote Narcissa, depicting the life of Washington missionaries Narcissa and Marcus Whitman who were killed by members of the Cayuse tribe. These chapters of Seattle’s music history and more are compiled in Before Seattle Rocked: A City and its Music by Kurt E. Armbruster. Supported by funding from the Naomi B. Pascal Editor’s Endowment, Musicians’ Association of Seattle Local 76-493, and 4Culture Heritage Special Projects, Armbruster spins an informative narrative thread. The 375 page story is woven from 123 bibliographic sources and Armbruster’s 75 interviews with participants from the local scene. Unfortunately, several of these outstanding individuals have recently left us – among them jazz impresario Norm Bobrow and jazz trumpeters Floyd Standifer and Ed Lee (pictured on the book’s front cover). On the back cover is a photo of the late jazz saxophonist Billy Tolles. Before Seattle Rocked recalls how this connective tissue binds all of the city’s inhabitants and reconstructs the musical skeletons overlooked or under cooked by previous local history books. Music from native, Nordic, Japanese, Chinese, African, and European performers filled the air where people celebrated, honored, danced, and relaxed. Over the years, Seattle’s booms and busts grew and gutted the body of working musicians. Packed with facts covering the region’s long musical history, from its Duwamish roots through 128 years of white settlement and foreign immigration (1851-1979), Armbruster still manages to have fun with words. In the introduction he writes, “For decades the symphony was a snake pit of Byzantine intrigue, the musicians’ union a farrago of feud and factionalism.” This playfulness keeps readers turning pages in spite of the broad subject and multitudinous characters. Within the dense drama of local stories, plenty of solo space is given jazz artists. Duwamish trumpeter/big band leader James Rasmussen riffs on regional native musical traditions. Saxophonist/club owner Ronnie Pierce spins yarns of colorful band leaders. Composer/teacher Jim Knapp provides history lessons in Seattle’s jazz education institutions. Multi-instrumentalist Jay Thomas remembers great times and talents from his early years. Grace and Dave Holden, children of pianist Oscar Holden recall their music education at Garfield and career launches in the local scene. 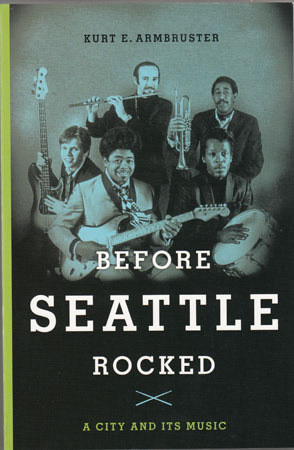 Beyond the big names of Ray Charles, Quincy Jones, Jimi Hendricks, and Curt Kobain, this latest book joins a growing list of titles about lesser known Seattle musicians. Miss Aunt Nellie: The Autobiography of Nellie Cornish published in 1964, gives a rich, though singular view of the city’s early music education community. Merle Irene Smith collected historical anecdotes of local songwriters in a 1989 publication Seattle Had a Tin Pan Alley, Too! In 1994, Paul de Barros dug into the roots of Seattle jazz in Jackson Street After Hours. Three years later, George Yoshida chronicled Seattle’s brief Japanese American jazz scene before Pearl Harbor with Reminiscing in Swingtime. James Bush surveyed the contemporary regional scene in 1999 with an Encyclopedia of Northwest Music. Recently, Peter Blecha assembled an historical photo scrapbook in Music in Washington: Seattle and Beyond. An imaginary recording by Seattle jazz pianist Oscar Holden becomes a significant totem in Jamie Ford’s fictional Hotel on the Corner of Bitter and Sweet. Visit https://www.facebook.com/kurt.e.armbruster to read more about Kurt.